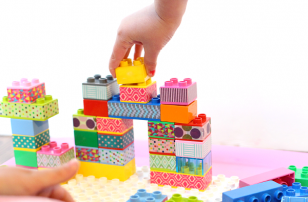 I am always looking for interesting ways to teach shapes, here is a fun way to get your little ones who love cars, trucks and such interested. While this craft requires a fair bit of prep it’s results will be worth it. 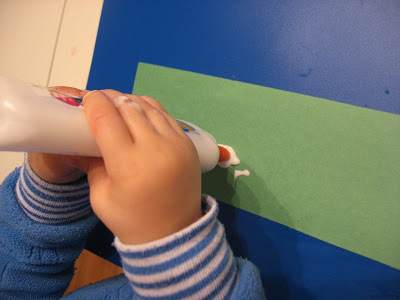 We talked about the shapes as I cut them out and the letters as I wrote them, older children can do this craft independently or at the very least write their own name! Gather your materials. 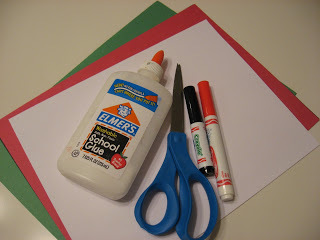 You will need 5 pieces of construction paper ( 2 red, 2 black and 1 green), 2 pieces of white paper, a red marker, a black marker, scissors and glue. 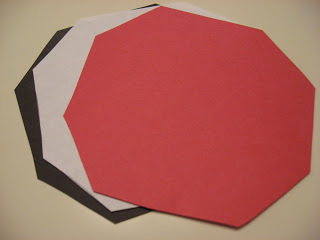 Start by drawing the outline of the signs on the paper – you can stack the red, black and white paper for the octagon( stop sign), as well as the red and black for the triangle (yield) , the green street sign can just be cut into a rectangle. Cut the signs out. 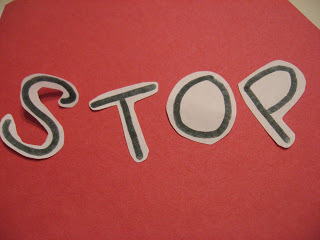 Trim the 2 inner layers of the stop sign ( the white a little and the red a little more). Repeat for the red layer of the yield sign. Write out the words for the street signs. It’s not pictured but the inner layer of the yield sign is white with red writing. 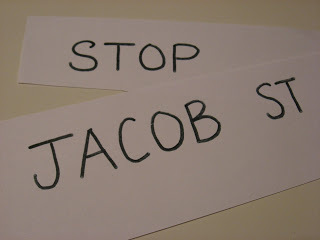 Cut the stop sign letters out individually. 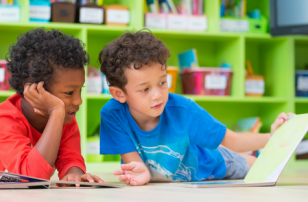 Invite your child to the table- if they haven’t been helping. 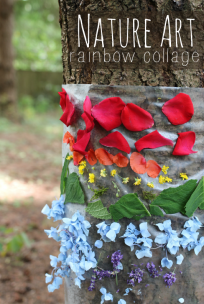 For really little guys I would do this before including them, if not the whole project will drag too much and they will want to move onto something else before they even get a chance to do anything. 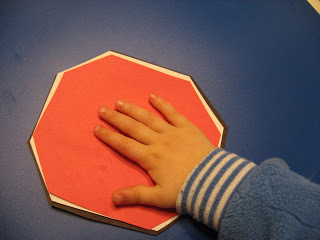 Start by gluing the stop sign together ,first the white on the black , then the red. 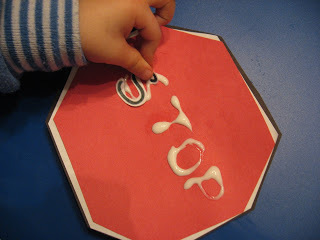 I wrote the word stop in glue and had my son match the letters to the glue, it worked perfectly to give him a chance to do it independently and he recognized each letter. Let dry. 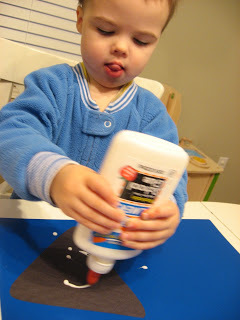 Glue together the yield sign. Ask your child what shape that it, and how many different triangles are you gluing together? Is one smaller than the other? Let dry. 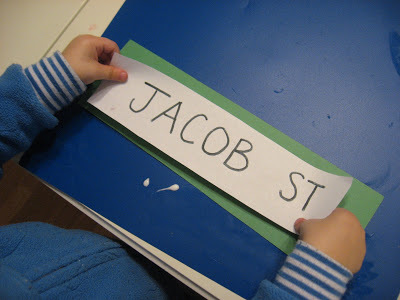 Time to glue your personalized name street sign ! 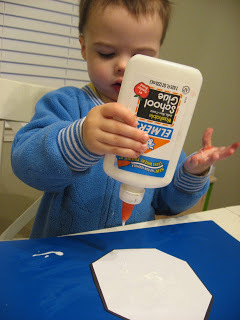 Add lots of glue! Vroom! Vroom! Went the little red car! They don’t go , Vroom! Vroom! Skreeeeeech! 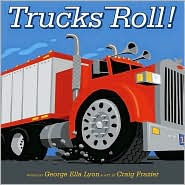 “Trucks Roll” by George Ella Lyon got a huge compliment from my son today when we read it. When he really really wants more of something not only does he ask for it with words but the sign language he learned so long ago comes out. This book got the “More Trucks!” out loud and the frantic more signs! 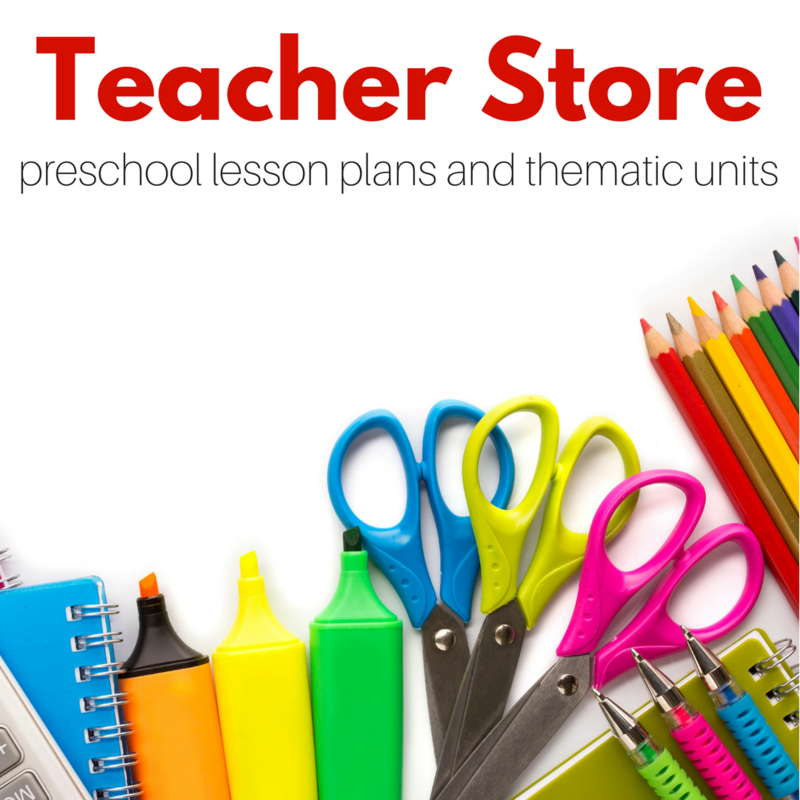 The book is the perfect length for 2-4 year olds who like my son love anything you can drive. It also explains well what trucks drivers do and how so many things make it from one place to the next. Cute book, worth a read for sure! ” Alphabeep! 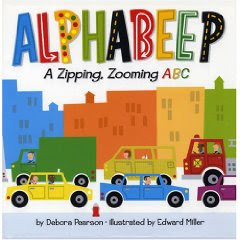 A Zipping Zooming ABC” by Debora Pearson is a great book for older toddlers and preschoolers. The transportation themed book uses rhymes and colorful illustrations to go from A to Z. The text was a bit long for my young toddler but I shortened it and he was able to enjoy the book , children 2 and up will love it just the way it is! This is on my must buy list. Very cute, thanks!! 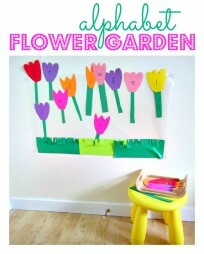 I will definitely do this with my 2 yr old! 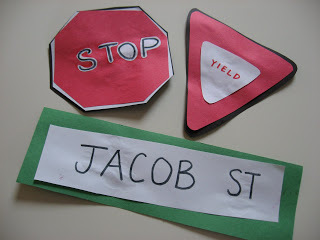 I had been planning to make a traffic signal craft with him as he loves to watch for the lights when we are out and about and will yell “Red means stop” and “Green means go”, these signs will be a great way to expand on that too!! I just wanted to tell you that we love your blog and follow it all the time. 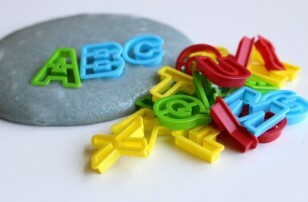 I have a daughter who will be 2 in March and her favorite thing on your blogs are the videos with the songs and poems. I have to hit the play button at least 3 times per video! It’s neat to see her repeat the words back! The video no longer works. 🙁 What is the tune for the song? I just rerecorded the son- It will be back up this afternoon! Thank you!!! You are amazing! I love this goldmine site!! !